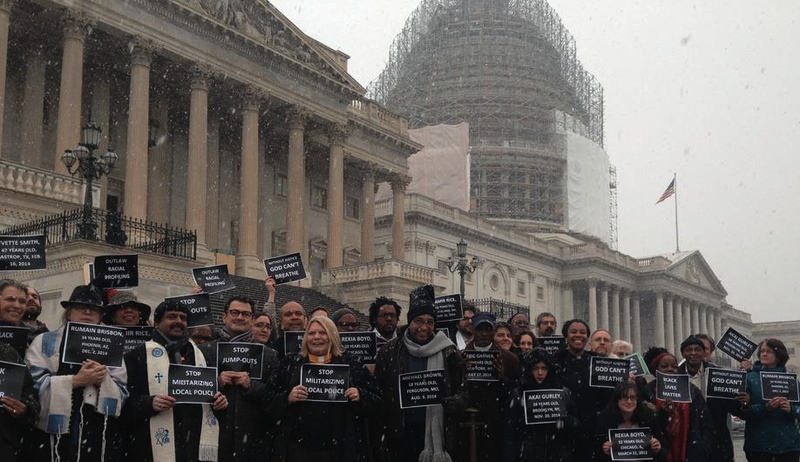 Faith Leaders Tell Congress: Take Action on Racial Justice | "A Song Every Day"
Posted on January 21, 2015 by vspatz	in Ethics, faith action and tagged #blacklivesmatter, #Dosomething, Auburn Seminary, Bend the Arc, DCferguson, Jews United for Justice, Standing on the Side of Love. Faith-based action brought the #BlackLivesMatter movement directly into Congressional space. The House Office die-in was designed to interrupt “business as usual” in the halls of Congress just as the new session begins. 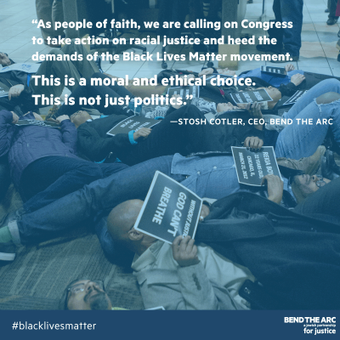 “As people of faith, we are calling on Congress to take action on racial justice and heed the demands of the Black Lives Matter movement,” Stosh Cotler of Bend the Arc said, as she and dozens of other faith leaders left the Longworth House Office building, Jan. 21. In addition to Bend the Arc, which has NY and DC offices, participants came from Auburn Seminary (NYC), Jews United for Justice (DC), Standing on the Side of Love, and a number of congregations in different denominations as well as unaffiliated Muslims, Jews, Christians, and others in support of DCFerguson and Black Lives Matter. Although the action’s duration on the Longworth cafeteria floor was short — not quite the planned 4-1/2 minutes, as Capitol Police insisted that the faith gathering disperse — it is hoped the action will inspire further education and action on the part of individuals and congregations across the country… leading ultimately to many needed changes, including Congressional action. Extend the moment yourself by learning more and following up. The commotion momentarily captivated the busy lunchroom, where many lawmakers and their staffs were eating during one of the first weeks of the new congressional session. Roll Call: with Thomas Williams’ photograph showing a “Cops say legalize pot” jacket becoming, not irrelevantly (however accidentally), part of the protest space. Stop Jump Outs: Sign and share to stop the racially-biased and dangerous practice of “Jump Outs” (a sort of version of “Stop and Frisk”) in Washington, DC.